And I have NO regrets. Fine use of a day. Even if it did brick my Kobo Glo. What a piece of crap. In my search for the perfect eReader, I’ve owned a huge number of them: a Kindle DX, a Kindle 4, a Nook Simple Touch with Glowlight, a Sony PRS-500, and, most recently, a Kobo Glo–basically one for each year that I’ve been using e-readers. None of them have been particularly satisfactory. Physical buttons for turning to the next page – Because when 95% of your interaction with a device is to do just one thing, then it makes sense for there to be a button to it–reaching over to tap the screen is more work and movement than just resting your finger on the “next page” button and flicking over to the next one. But no e-reader has all these elements. Of them, the Nook Simple Touch with Glowlight probably comes closest, but the physical buttons on that machine are so unresponsive that it actually hurts my thumb to push them. And the screen developed a tiny and extremely annoying defect on my very first day of ownership, so I saw the writing on the wall and returned it. My regular old $69 Kindle 4 has all of these features except for the backlit screen. For awhile, I’d resigned myself to the Kobo Glo. The only thing it lacked was the physical buttons. (Although its interface was punishing–the Glo had no back button, or even back functionality, so that if you followed a link to somewhere in a book, then you were stuck there. It was impossible to get back to where you’d come from) It was extremely annoying, but I even finally accustomed myself to the touch-screen interface. But today, after just five months of ownership, the screen froze and it would do nothing. 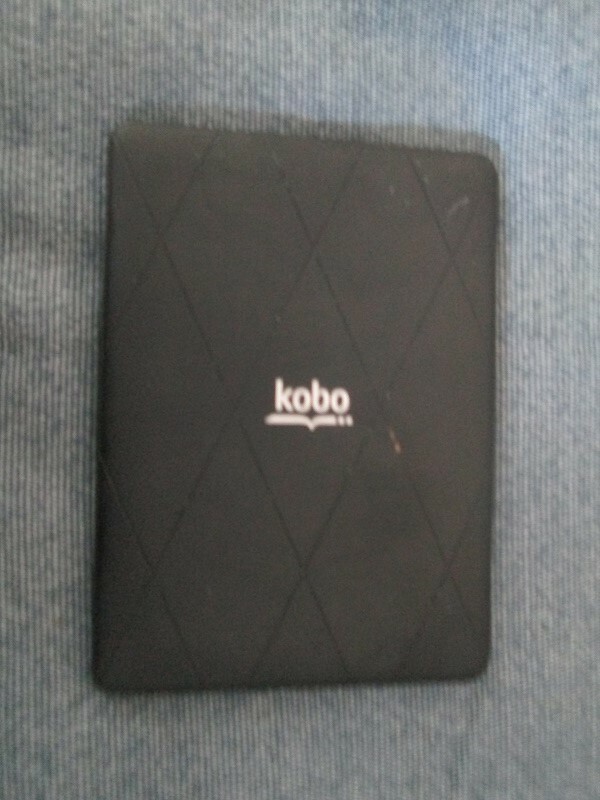 I called Kobo (since it was still within the warranty period), but they insisted that I’d damaged it and refused to replace it. I’ve since tried to return to my Kindle, but now I’ve become accustomed to the backlit screen. Ay mi. I think that next I’ll try the Kindle Paperwhite. Yeah, I’m with you on your five points. I was buying an e-reader in August to replace my lost/stolen Kindle Keyboard (formerly 3rd generation Kindle) and had to decide between Kindle 4, Paperwhite (1st gen), and B&N Simple Touch with Glowlight. I went with the Kindle 4 in the end because of weight and size (I take it with me everywhere I go). The decision was also possibly psychological; in replacing my device I wanted to retroactively minimize the cost of the loss as well as not be so upset if my new e-reader were to get lost or broken. Overall I’m happy with the decision, but at times I do feel the lack of a backlight. Yeah, I’m back to using my Kindle 4 for now. It’s actually pretty good. And the cost cannot be beat. I’ll see how I feel about it. Actually, my bitching on twitter led them to replace my Kobo Glo, so maybe I’ll return to that. Choices choices.